The most straightforward and obvious way of estimating climate sensitivity to a doubling of CO2 is by examining the result of the “experiment” which we've performed on the Earth's climate, by raising the atmospheric CO2 level from about 311 ppmv in 1950 (or 285 ppmv in 1850) to about 408 ppmv in 2018. We simply examine what happened to temperatures when the atmospheric CO2 level was raised by 31% (or 43%), and extrapolate from those observations. However, there are a few pitfalls with that approach. For one thing, natural global temperatures variations due to ENSO can be larger than the “signal” we're looking for, so it is important that we choose an analysis interval which avoids those distortions. For another, it would be a mistake to assume that all of the warming which the Earth has experienced since pre-industrial conditions was due to anthropogenic CO2, because much of that warming occurred when CO2 levels were still very low, and because we know of other factors which must have contributed to warming, such as rising levels of other GHGs, and probably aerosol/particulate pollution abatement. 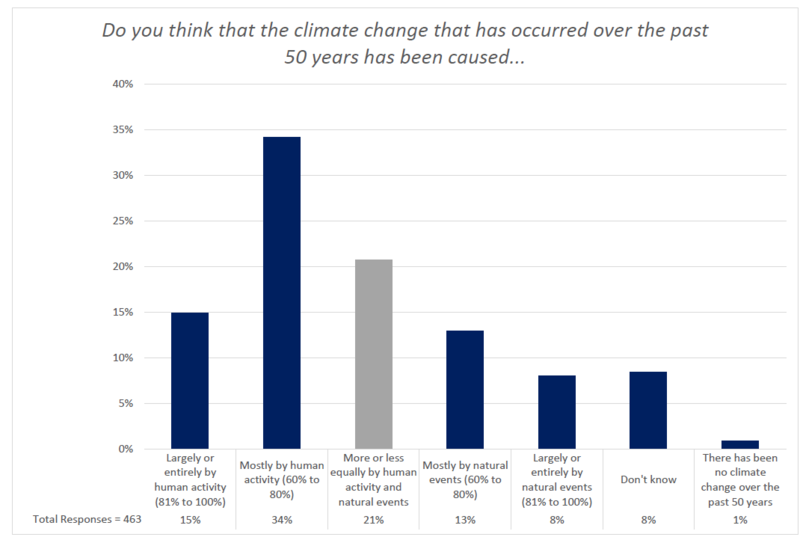 So the key question is, how much of the warming can be attributed to rising CO2 level? In the calculations below, the assumed answer to that question is an explicit parameter, “A” (for “Attribution”). Note #1: ECS is usually estimated to be about 1½ × TCR. Note #2: the above discussion doesn't mention minor GHGs like O3, CH4, N2O & CFCs. To take them into account, there are two simple approaches you can use. One is to substitute estimates of “CO2e” (CO2 equivalent) for C1 and C2. The other is to adjust A to account for the fact that some portion of the warming (perhaps one-fourth) is due to other GHGs. So if we attribute 57% of the warming to anthropogenic causes, and 75% of that to CO2, the attribution factor, A, should be 0.75 × 0.57 = 0.43 (43%), resulting in a calculated TCR sensitivity estimate of 0.81 °C per doubling of CO2. Note that our calculation includes the effects of both positive and negative temperature feedbacks. For ECS, multiply TCR by 1.5, yielding 1.21 °C per doubling of CO2. The ECS/TCR ratio is sometimes estimated as high as 1.65:1. If we use that multiplier we could get the ECS estimate up to 1.34 °C per doubling of CO2, which is still slightly below the IPCC's “low end” estimate of 1.5 °C per doubling. On the other hand, if the ECS/TCR ratio is only 1.25:1, then ECS = 1.25 × TCR = 1.01 °C per doubling. Even if 100% (rather than 57%) of the warming since 1960 is attributed to anthropogenic causes (and 75% of that anthropogenic warming is attributed to CO2), TCR still comes out to only 1.41°C per doubling, and ECS = 1.5 × TCR = 2.12°C. It is very difficult to approach the IPCC's “midrange” ECS estimate of 3°C per doubling, or the CMIP5 models' average assumption of 3.2°C per doubling, using this sort of analysis. 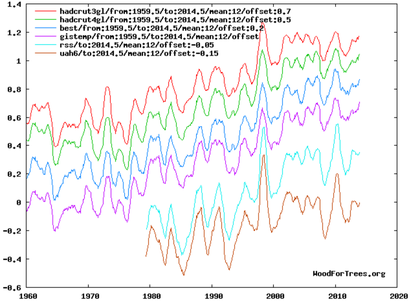 Bates 2015 used satellite measurements, and calculated an ECS (EfCS) sensitivity of about 1°C. More recently, Lewis & Curry 2016 reported a TCR sensitivity of 1.34 (0.91–2.44) °C. Christy & McNider (2017) (or preprint) attempted to account for volcanic and ENSO distortions (like Santer et al 2014). They measured an underlying rate of climate warming of 0.096°C/decade, and calculated a lower tropospheric TCR climate sensitivity of +1.10 ±0.26 °C per CO2 doubling. The paper is quite long, but here's a readable discussion. Atmospheric Physicist Richard Lindzen discusses an innovative approach to estimating climate sensitivity, based on measurements of evaporation rate changes, starting at 35:46 in this video. The result is a sensitivity estimate of about 0.8°C per doubling of CO2. 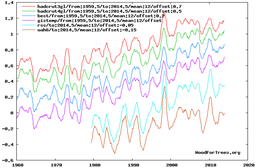 Way back in 1984, Hansen et al estimated an EqCS sensitivity of 3.0±1.5 °C (see also this paper, the same year). Based mostly on GCMs, the IPCC's latest AR5 report gives exactly the same estimate. 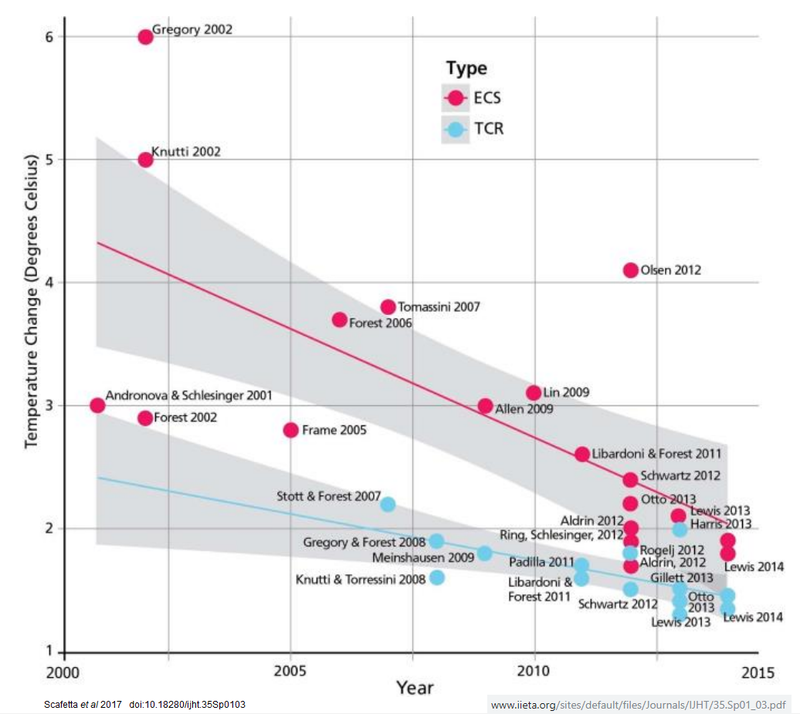 Climate sensitivity estimates in the scientific literature vary wildly, but have generally been declining, as discussed on the sealevel.info Resources page.